We picked up a ton of trash! Thank you to all the volunteers for making the event a success. Please set aside some time on Saturday, April 16th from 9:00am to 2:00pm, and join your neighbors as volunteers for the most worthy event. Gloves, trash bags, and water transportation will be provided, as well as morning coffee & donuts and an afternoon hotdog BBQ lunch. Hope to see you April 16th! For more information, contact event coordinators Deborah Kutzled or Dave Lishin. 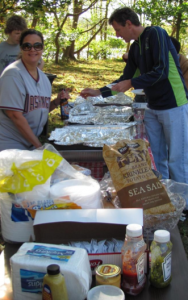 The Piscataway Hills shoreline is now more beautiful than ever, thanks to the 25th Annual Potomac River Cleanup. Mike Kutzleb (right) and other volunteers load the 48 bags of trash and other debris they cleaned up into a trailer for disposal. Thirty volunteers from Piscataway Hills gathered at 9 a.m. on April 6 at Lot 39 Waterfront Park to pick up trash along Piscataway Creek. Working well past noon, the volunteers collected 48 bags of trash and six tires. At 20 pounds per bag, plus the tires, the workers pulled approximately 1,000 pounds of trash from the shore- line, estimated cleanup cocoordinator Debbie Kutzleb. The cleanup included all the shoreline along Lot 39, along with about half a mile along the adjacent National Park Service property. 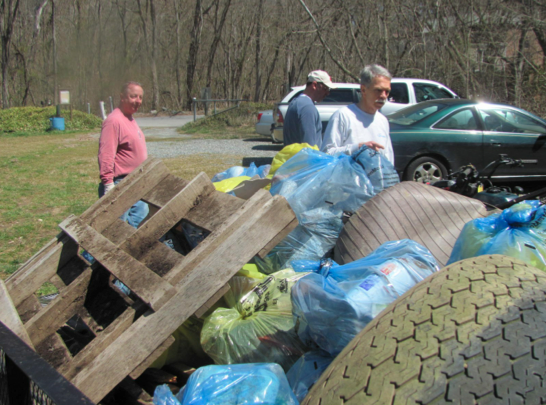 Dave Lishin, the other cleanup co-coordinator, also picked up three bags and seven tires on the Accokeek side of Piscataway Creek. Shoreline areas that had been cleaned in previous years had relatively little trash, allowing the cleanup effort to focus on additional stretches that needed attention. It was apparent to the volunteers that the annual cleanup has been steadily improving the condition of the Potomac River and its tributaries. Beautiful spring weather aided this year’s cleanup effort, and the volunteers received coffee and donuts to keep up their strength during the work period, and were rewarded with a cookout at Lot 39 afterward. 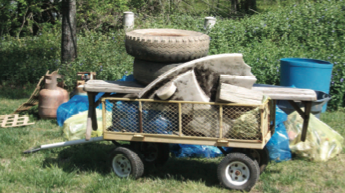 The Potomac Cleanup is run by the Alice Ferguson foundation, which also runs the Hard Bargain Farm in Accokeek. The 2013 cleanup included 633 sites reporting from Maryland, Virginia, West Virginia, Pennsylvania and Washington, DC, according to the Foundation. A total of 14,586 volunteers picked up 312 tons of trash, including 193,800 beverage containers 27,400 cigarettes, 27,200 plastic bags, and 1,314 tires. 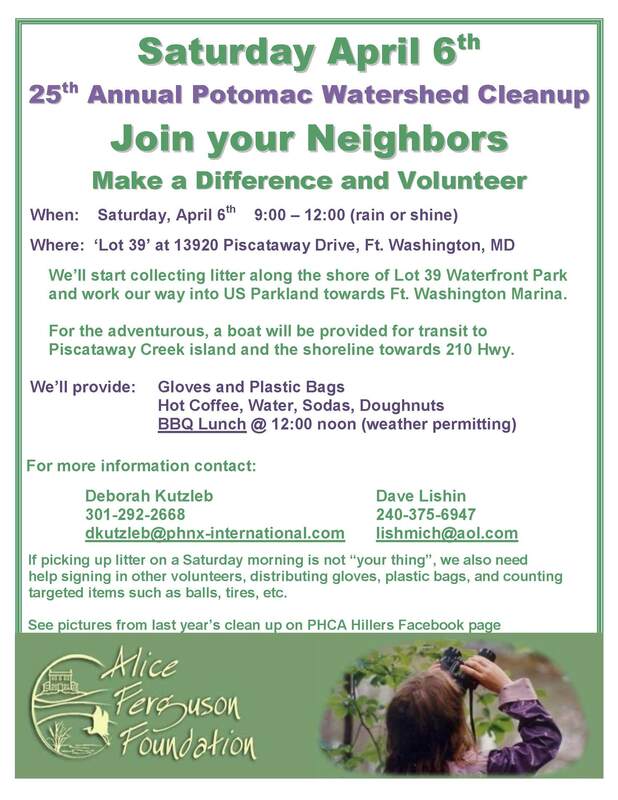 Information for the upcoming Potomac Watershed Cleanup event is attached. 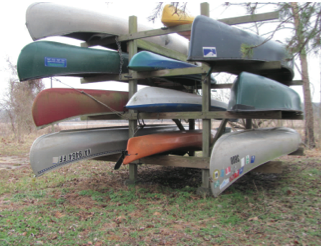 For those who may be unaware, the PHCA offers the use of a Canoe Rack which provides individual slips of up to 12 canoes or kayaks. The Canoe Rack was the idea of one of our past Board Members and residents, Leo Morowski, who passed away before the structure was built, but in whose name it is dedicated. To offset the cost of maintaining the structure and to ensure active slip usage (by residents who canoe several times annually), the PHCA Board has decided to assess annual fees of $20 per slip for PHCA members and $40 per slip for non-PHCA members. The fees will be implemented on the first Saturday of April 2013, the same day as the Annual Potomac River Clean-Up Event.The annual usage fee year will run from April 1 to March 31. Piscataway Hills residents who want to start or continue using one or more of the spaces on the canoe rack should contact PCHA Board Member Calvin O’Neil at the contact information below. Current slip users will receive first preference to maintain your existing slip. The slip usage fee must be received no later than March 31 to maintain usage or your boat will need to be removed by April 6, 2013. Any boats left in an unpaid slip on April 6 will be determined to be abandoned and disposed of during the Annual Potomac River Clean-up event. Safety and security of our residents and property are two primary and ongoing concerns of the Pis- cataway Hills Community Association (PHCA) Board Members. It’s been over 10 years since the last replacement of the lock and issuance of new keys for the gate to the Piscataway Hills Waterfront Park (aka Lot 39). During this timeframe, we have experienced many home sales with old neighbors leaving the community and new residents taking their place. Therefore, the PHCA Board has decided it’s time to change the lock and issue new keys to the Waterfront Park gate. This will occur the first week of March 2013. If you wish to obtain a new gate key for vehicle access to the Waterfront Park, you can do so by contacting PCHA Vice President Dave Lishin. PHCA members approved plans for a new playground at Lot 39 Waterfront Park during the June 26 quarterly meeting. It will be the first play equipment installed at the park since an old swingset made of telephone poles was dismantled more than 25 years ago. The new playground equipment is to cost $3,200, with PHCA to provide $1,200 and the rest coming from a special fundraising campaign. Supporters of the playground said that as of mid-September, $1,478 had been donated, leaving $522 still to be raised. Designed for younger children, the new playground is to include a sliding board, a covered climbing platform, swings, and a rope ladder. It is to be assembled by volunteers and be located in the northwest corner of Lot 39, near the volleyball area and farthest away from the water. The members also authorized PHCA to purchase liability insurance, which was estimated to cost between $500 and $900 per year for $500,000 of coverage. With average PHCA membership of about 70 households, the cost per member would be about $10 per year. PHCA President Gwynn Roberson said the Board of Directors had been advised that liability insurance would help prevent PHCA from losing control of Lot 39 in case of a lawsuit. Concerns were also raised that individual board members might be liable for damages in certain cases. It was later determined that PHCA had carried liability insurance until about30 years ago. Opponents of the liability insurance proposal contended that, because Lot 39 is not considered a buildable lot, it has little value and so would not attract lawsuits. Insurance coverage of $500,000, it was argued, could actually encourage lawsuits by increasing the potential payout to plaintiffs and lawyers. In addition, they pointed out that, even if PHCA lost Lot 39, residents would still have the right to use the property as stated in their deeds. Immediately after the discussion, members voted 27-16 to authorize PHCA to buy liability insurance, and the playground proposal was approved by a vote of 37-6. Funding for the playground and liability insurance in the 2013 budget will be considered at the next PHCA quarterly membership meeting, Tuesday, September 25, at 7 p.m. at Spirit of Elijah Church. With more children likely to be playing at Lot 39, especially after the playground is installed, efforts to reduce unsanitary dog droppings were discussed. One idea was to install dog cleanup bags on a post in the park. In general, dog owners were strongly encouraged to clean up after their pets. 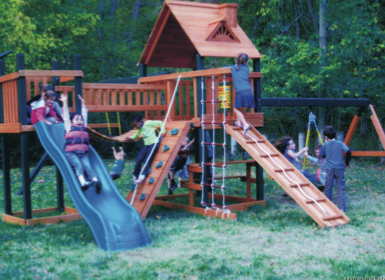 The children’s playground which was announced by fellow resident Maureen Bartee at the Spring PHCA Quarterly meeting was selected. 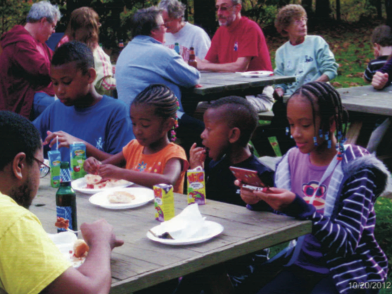 Voting for expenditures for the playground will take place at the Summer quarterly meeting. 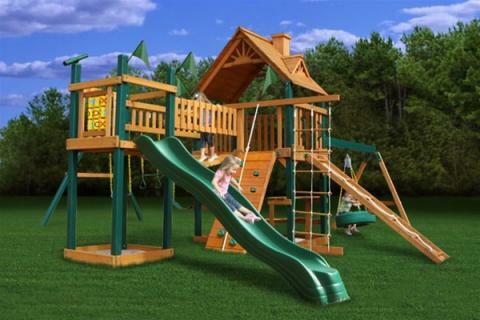 The playground includes a trapeze swing, tire swing, wave slide, clatter bridge and tower, climbing ramp and rope, rope ladder, built-in picnic table, sandbox, Tic-Tac-Toe spinner panel, telescope and more. To see additional details, click here: Blue Ridge Pioneer Peak. Lot 39 Waterfront Park was transformed into a little bit of Germany on October 15 as Piscataway Hills residents celebrated Oktoberfest with bratwurst, potato pancakes, German beer, and lots and lots of desserts. Newly inaugurated Piscataway Hills President Gwynn Roberson continued her previous role as head chef of the annual event, for which the dozens of attendees throughout the afternoon were extremely grateful. In addition to the traditional bratwursts from Baltimore, this year’s fare included homemade red applesauce, soft pretzels, German potato salad, pulled pork and red cabbage, and chicken and sauerkraut. Bierocks made with ground turkey were served for the non-pork and healthier eaters. Although the weather was warm and sunny, any chill would have been warded off by a blazing bonfire kindled by PHCA Board Member Neil Ayers. Piscataway Creek also sparkled in the bright fall sunlight, inviting picnickers to stroll along the water and enjoy the views and the abundant wildlife. Other activities included volleyball, badminton, horseshoes, tetherball, and all the other games and balls from Treasurer Don Benedict’s garage. One activity fromprevious years that fell victim to technology was the Redskins game on TV, as it was considered doubtful that a digital broadcast could be picked up reliably. So the PHCA Board voted to celebrate Oktoberfest on a Saturday and allow people to watch the Redskins lose on Sunday in the comfort of their own homes.